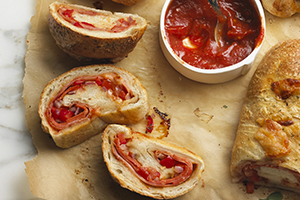 For a fun and tasty dinner experience, get the family in the kitchen to make stromboli. Serve with tomato sauce on the side for dipping. If the dough springs back when rolling it, let it rest for a minute and then roll again. On lightly fl oured surface, cut dough into 4 equal portions and shape into balls; let rest for 5 minutes. With fl oured rolling pin, roll out each ball into 9- x 6-inch (23 x 15 cm) rectangle. Spread each dough with 1 tbsp (15 mL) of the tomato sauce, leaving 1-inch (2.5 cm) border. Sprinkle each with 1/4 cup (50 mL) of the cheese; top with 2 slices of ham, overlapping and trimming to fi t, if necessary, 3 pepperoni slices and 1/4 cup (50 mL) each of tomato and red pepper. Sprinkle with 1 tbsp (15 mL) of the onion, 1/4 cup (50 mL) of the cheese and 1/8 tsp (0.5 mL) of Italian seasoning. Starting at the long end, tightly roll-up dough. Place seam side down on large parchment paper-lined baking sheet. Cut 2 slits in dough. Brush with egg and sprinkle with a pinch of Italian seasoning. Bake in 450°F (230°C) oven for 20 to 25 minutes or until dough is puffed and golden.